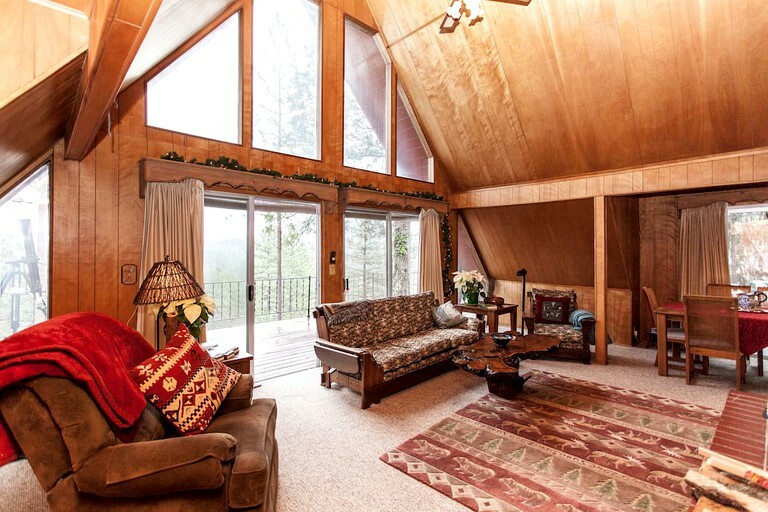 Set among the Tahoe National Forest, this unique a-frame rental offers three bedrooms, two bathrooms and can sleep up to seven guests. 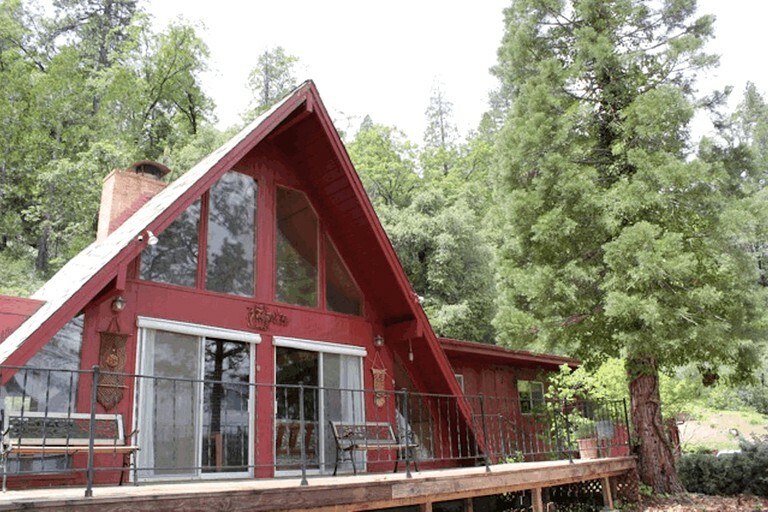 This cabin was built in the 1960's and many of the furnishings reflect a charming, older feel. Guests will find one bedroom with a full bed, one with a queen-size bed and one with two single beds. 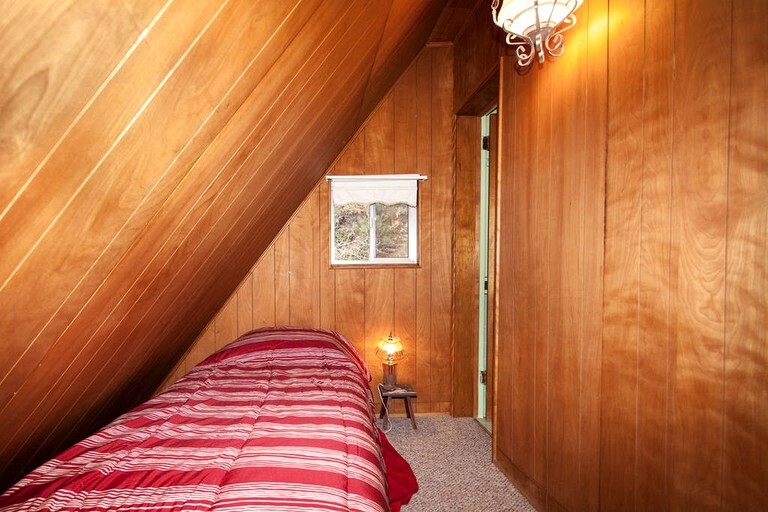 There is also a sleeping loft with an annexed bathroom and one single bed. There are two bathrooms, one with a shower and one with a bathtub. 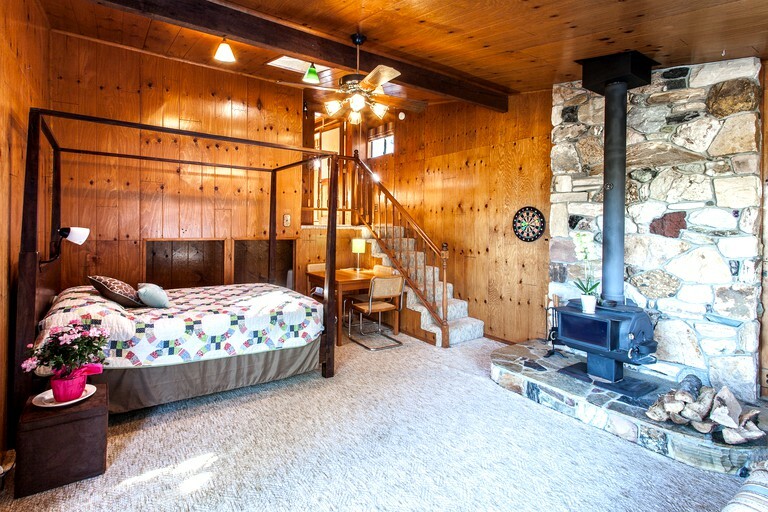 The master bedroom comes with a wood stove and can also serve as a family room with games. 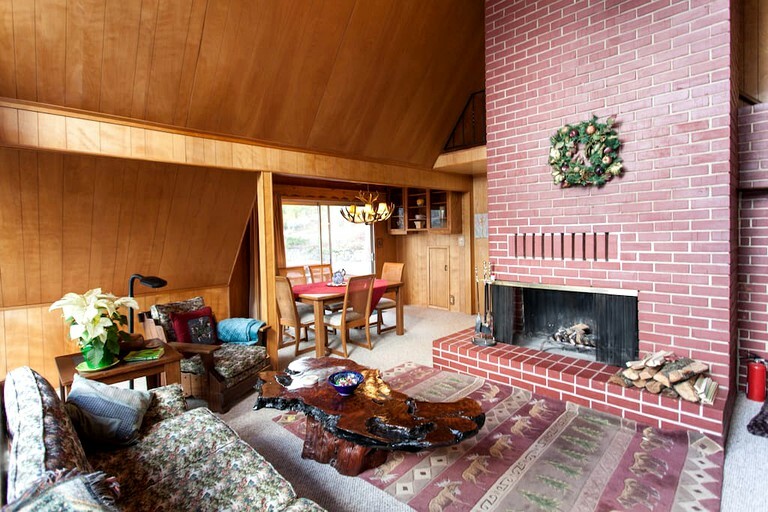 This room has its own wood-burning stove and is private and away from the main living room. In winter, the wood stove is the main source of heat. 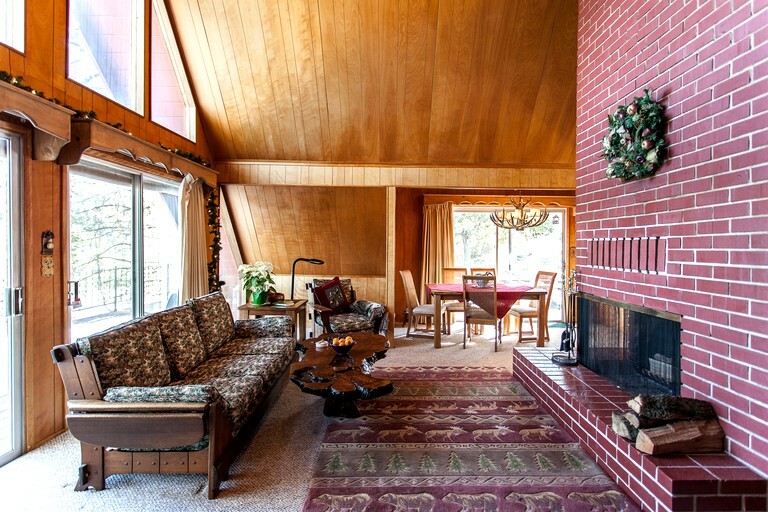 There is a grand living room with vaulted ceilings, wood paneling, and immaculate ceiling to floor windows. 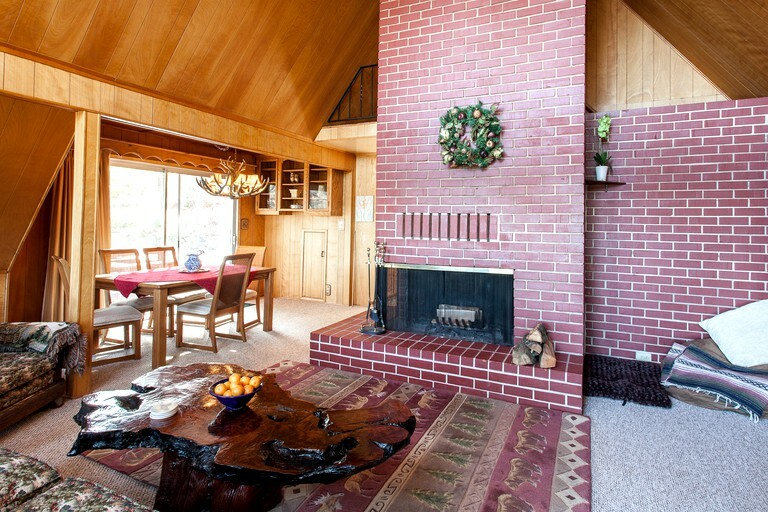 Here guests will also find a large fireplace and stunning views. 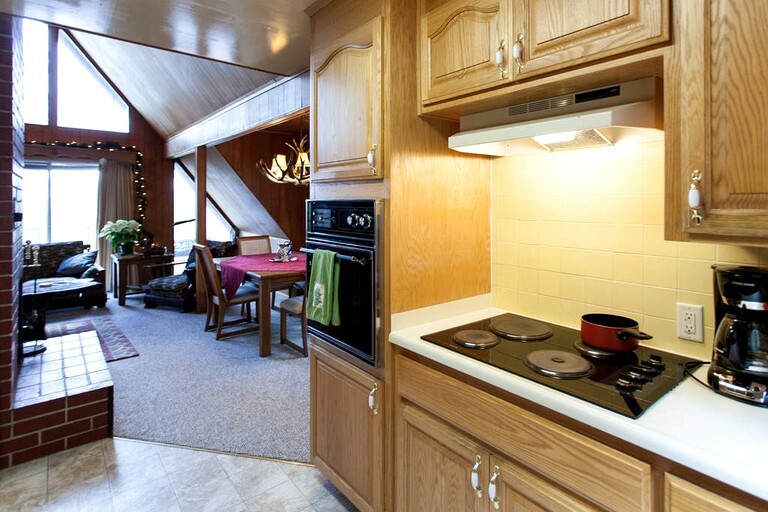 There are built-in heating and air conditioning, which works well in the central part of the cabin (living room, dining area, kitchen, bedroom, and loft receive). 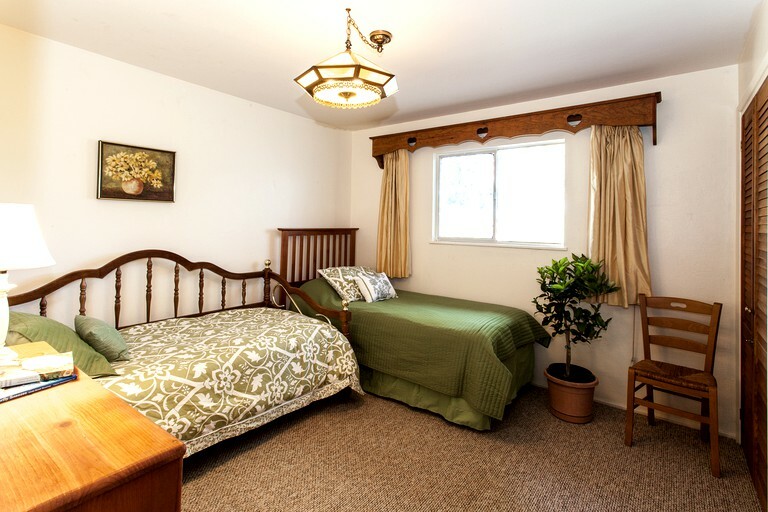 The hallway and end bedroom are not vented for heating or air conditioning, but fans and electric blankets are provided to keep guests comfortable. Other amenities include an exercise bicycle, a fireplace, an iron and ironing board, a hairdryer, Wi-Fi, cell service, and a brand new water-saving washing machine. There isn't cable; however, guests can use their Netflix, Hulu Amazon Accounts, or the DVD selection on the TV and DVD Player. There are many DVDs available—a selection of approximately 50 movies for adults and children. 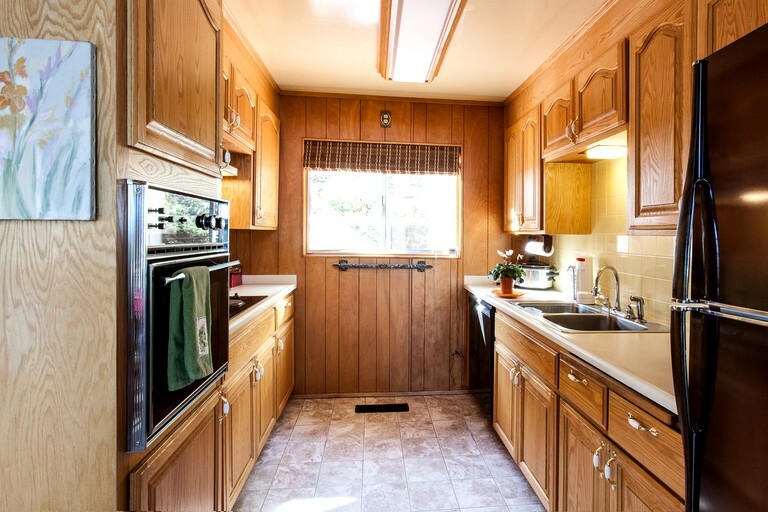 Guests will also have a fully-stocked kitchen (with cooking utensils, pots and pans, plates, cups glasses, and salad bowls), and linens are provided, including several electric heating blankets, comforters, quilts, and blankets. Parking for up to three cars is allowed on the property. 4WD or AWD are recommended, as the drive is gravel and gets steep midway. There is parking at mid-point up the driveway for other vehicles. 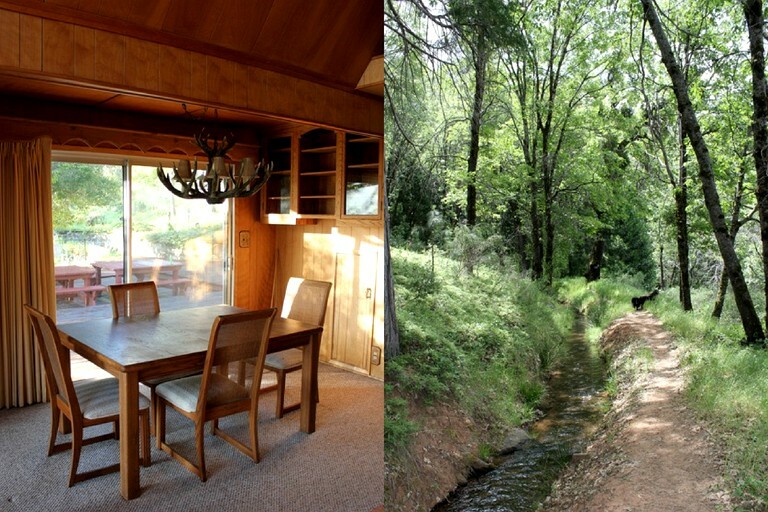 This property is the perfect retreat or getaway for those seeking a peaceful and beautiful spot. 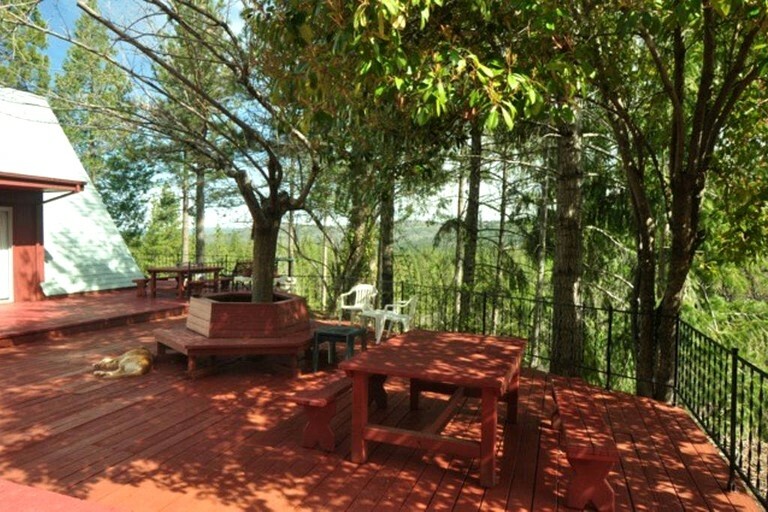 Guests will enjoy inspiring views of forest lands from the deck. At night, they can observe thousands of stars in the sky and the sound of chirping frogs. 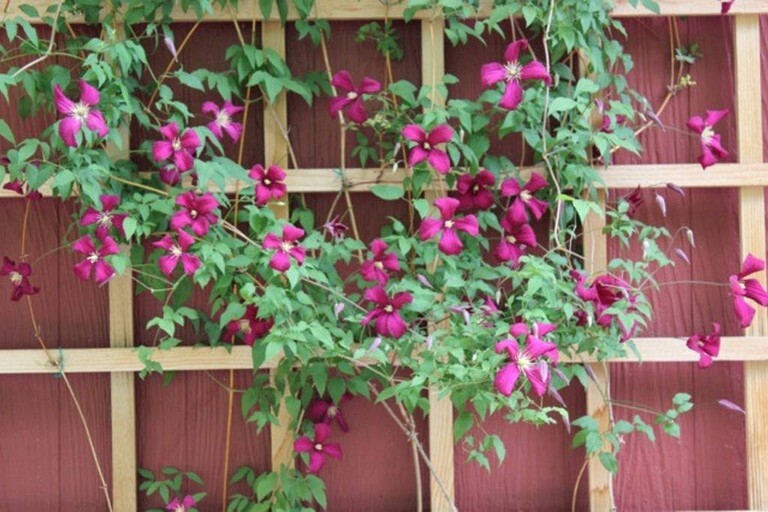 In the spring, glampers will enjoy the natural-style pond and many flowers. 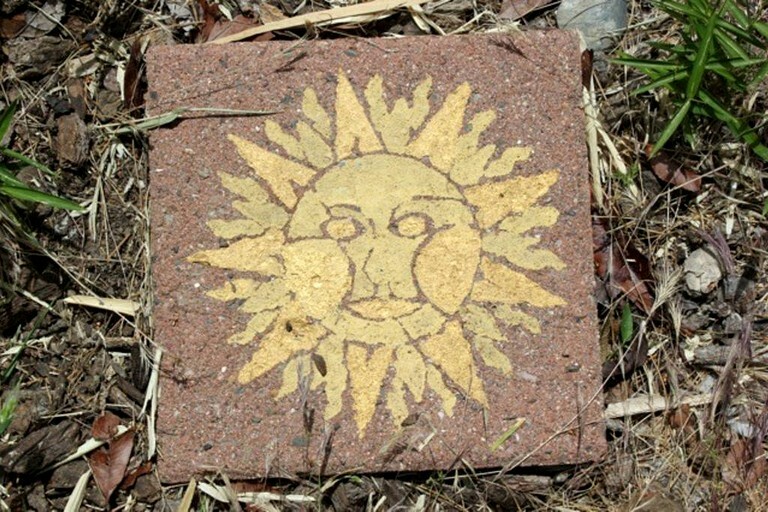 In addition, there are many other wonderful activities to partake in all year round and seasonally, including skiing, swimming, hiking, fishing, boating, mountain biking, and more. Sugar Bowl Ski Resort is just 45 minutes away, an amazing mountain-bike trail entrance that goes for 120 miles is just half a mile away. 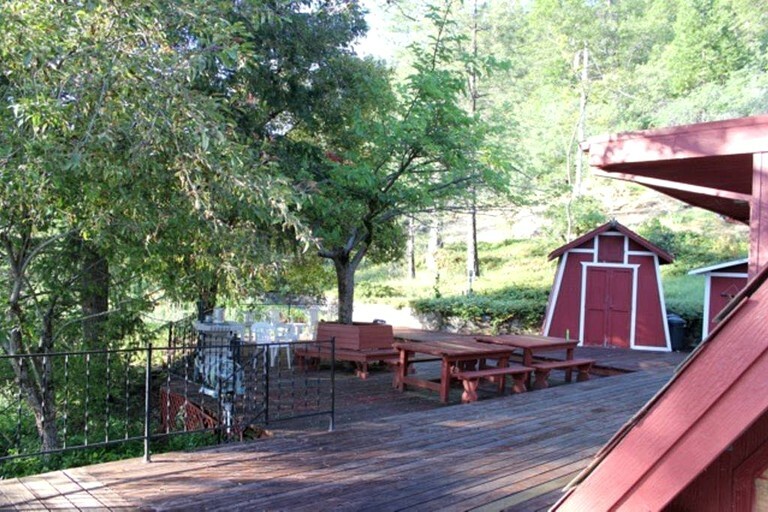 Five vineyards are less than 30 minutes from this property and the “magical,” “sun-hugged,” “granite-lined” Yuba River is just seven miles away. The Nevada Theater, where Mark Twain read in the 1860's is just three miles away still features monthly plays. 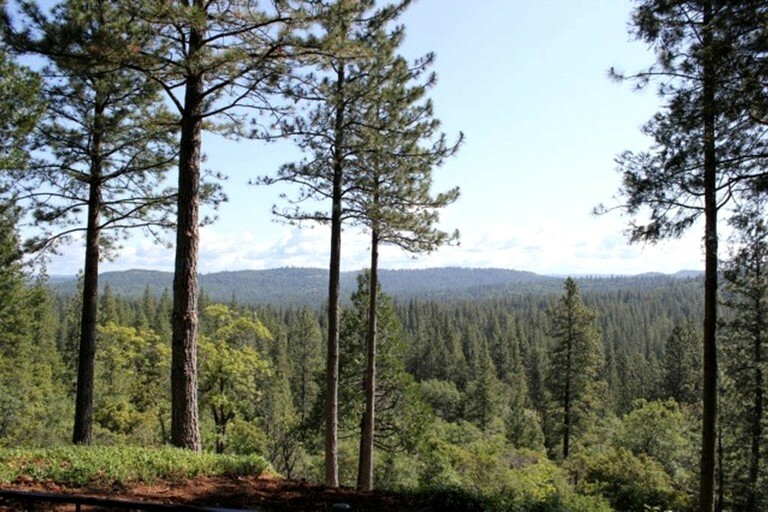 The Tahoe National Forest is located in the northern Sierra Nevada. Rivers, snow-capped peaks, and dense forests offer outstanding recreation year round. Nevada City is usually below the snow line but it’s close enough to be atop a world-class mountain in less than an hour. 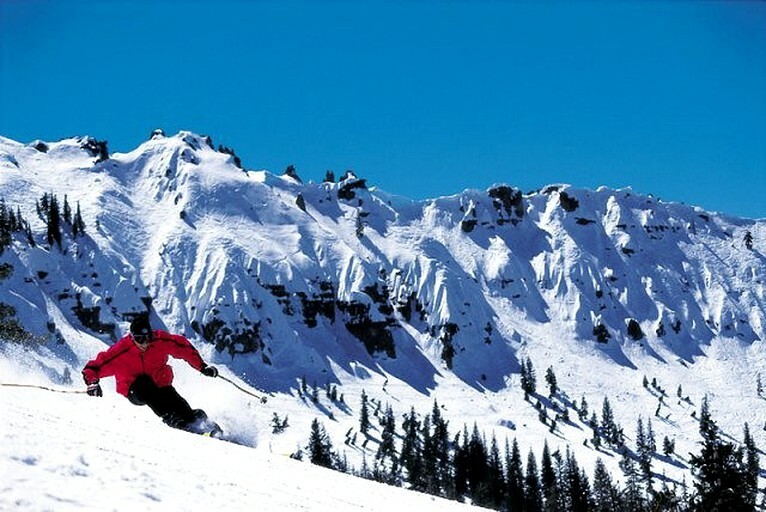 The closest ski resorts are 45 minutes east on Donner Summit. 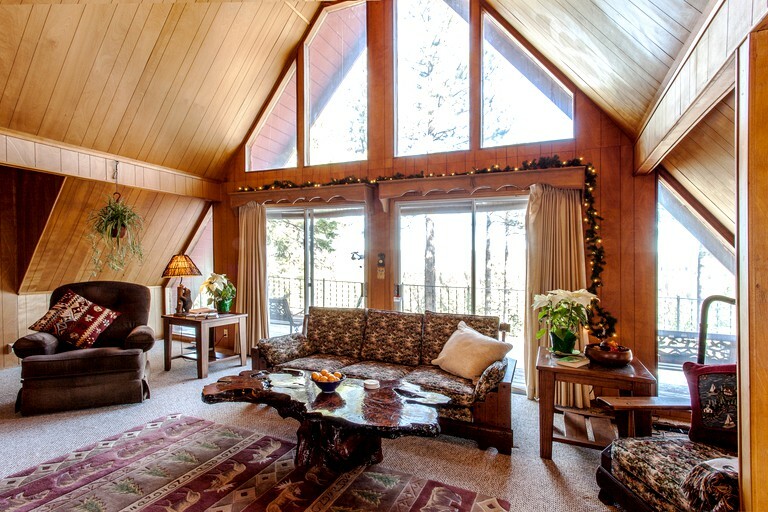 Here guests will find Sugar Bowl, Donner Ski Ranch, Soda Springs, Boreal Mountain Resort and Royal Gorge Cross Country Ski Resort. Another 15 minutes will take glampers to the Northstar, Tahoe-Donner, Squaw Valley, and Alpine Meadows. Steep Hollow, a nearby cross-country ski trail system marked by the Nordic Skiers of Nevada County, is located on Highway 20 just past the Alpha-Omega rest stop 18 miles east of Nevada City. 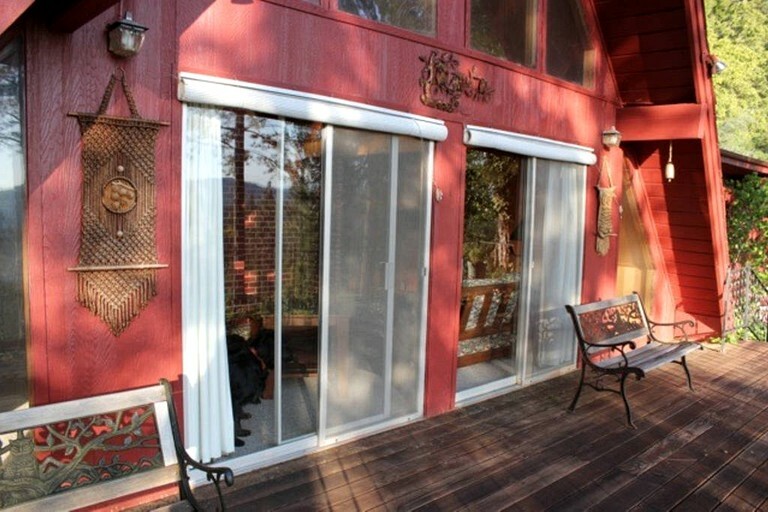 There is a refundable damage deposit of $250 at this property. There is no smoking and no use of pesticides allowed at the lodge. The lodge is backed up by the woods so woodland insects and animals are to be expected.